Falcon relief on the island. Remains of a Roman fortress on the island. Depiction of a bee on a stone. Some ruins on the island. One of a few temples on the island. Wall relief found on the island. View from Elephantine on Aswan. Papyrus picture on a stone found on the island. A beautiful relief from Elephantine island. Satet temples of Sesostris I. Remains of a temple on the island. Wall painting from a temple. The island of Elephantine, located to the north of the Nile?s First Cataract, is situated between the modern city of Aswan on the east and the pharaonic cemetery of Qubbet el-Hawa to the west. 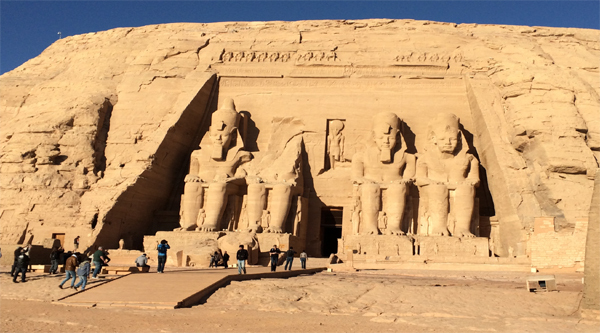 The monuments of Elephantine have been excavating & restoring since 1969. The reconstructed temple of Satis, situated on the top of one of the earliest extant shrines in Egypt, is a remarkable example of modern restoration techniques. The southern tip of the island, once of a strategic importance and great renown, has been turned into an important tourist attraction & huge open-air museum with stairways and footpaths. Temples and cemeteries are located on the southern end of the island, including a sanctuary of the goddess Satet, who was patroness of Elephantine. A sanctuary to the goddess was founded in the 2nd Dynasty, and the temple here was rebuilt during the Middle and New Kingdom as well as in Ptolemaic times. The ruins of a temple of Khnum, the ram god associated with the First Cataract of the Nile, are also located on the island. The main terrace of this temple dating to the 30th Dynasty still remains in addition to a monumental gateway. Together with Anuket, goddess of Sehel island, these three deities formed the triad of the Elephantine area. On the west side of the island is the sanctuary of Heqaib, a deified Elephantine nobleman, who was buried in a rock-cut tomb in Qubbet el-Hawa or Dome of the Wind. He was venerated throughout the Middle Kingdom, and his sanctuary is filled with statuary and stelae as well as shrines and offering tables that were dedicated by both kings and the elite. On the east side of the island is the Nilometer, a stairway on the river?s bank constructed of regular-shaped stones this useful tool was so designed that the water, rising and falling with the ebb and flow of the flood, could register maximum, minimum and average water levels. A text that was inscribed on a wall of the Temple of Edfu explains to us that when the river rose to 24 cubits and 3.5 hands at Elephantine, there was a sufficient amount of water to supply the needs of the whole country. Plutarch, the Greek writer, recorded that the Nile once rose at Elephantine to a height of 28 cubits (14.70 m). These measurements were done in cubits, approximately the length of the human forearm, with those indicated on the Nilometer dating to the Roman period and later. In 1870 the Nilometer was repaired by Khedive Ismail. He recorded his work in both French and Arabic. A new scale was established and the ancient construction, unused for centuries, came into use once more. On the walls of the staircase are records in Demotic (fluid hieroglyphic hand) and Greek, showing different water levels. A second Nilometer, dating back to the 26th Dynasty, was found during excavation. The instrument is unique in having its calibration based upon the level that flood waters reach above the agricultural land, and not how high they are above the low-water mark. Ptolemaic shrine from Kalabsha, dedicated to the Nubian god Mandoli and saved from Nubia, has been reconstructed at the southern tip of the island. 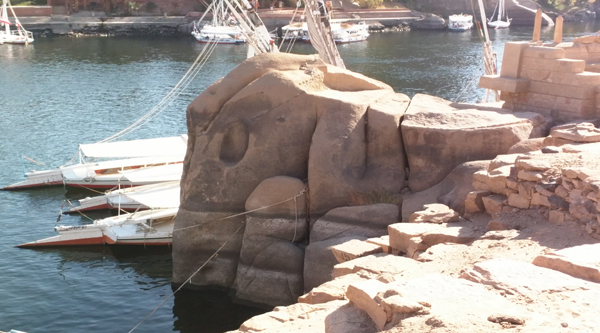 Nearby, a statue of an elephant, the heraldic emblem of the area (found during excavations in Aswan), has been placed. The Aswan Museum on Elephantine Island, which contains antiquities excavated from Aswan & its environs, as well as objects from Nubia, was 1st built as a resting place for those engaged on building the original Aswan Dam. The exhibits include miscellaneous pre-dynastic objects recovered from Nubia before it was inundated and some old & Middle kingdom objects, especially from the Hekaib Sanctuary. The mummies of a priest & priestess of Philae that were found on the Island of Hesseh, as well as a mummy of a sacred ram. Unfortunately since 2011 the museum is closed. The excavations are still undergoing on the island so new discoveries are definitely to be done.